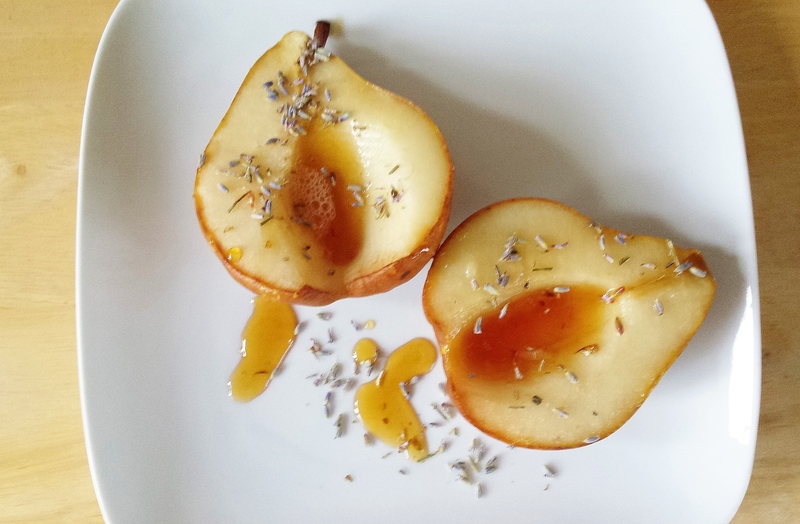 When I made these, I used a mere 1/2 teaspoon on four pear halves, and some bites still tasted like I was eating fistfuls of potpourri. So I’ve reduced the recipe amount to 1/4 teaspoon. A little definitely goes a long way! And if you don’t have any culinary-grade lavender and want to make this recipe without it, the lemon and honey glaze on its own is really very lovely. However, I must say, there is no experience quite like opening your oven to a sweet, warm blast of lavender perfume – it’s worth trying once just for that! Slice pears in half lengthwise and cut out the middle areas that contain the seeds. Arrange halves in a baking dish, cut side up, and drizzle evenly with the lemon juice, honey, and lavender. Bake for 30 minutes, or until pears are soft and fully cooked through.